The aim of the course is to improve the way any organisation delivers the ITIL Service Lifecycle. It will increase the knowledge and understanding of terminology, processes, activities and roles. It provides a detailed exploration of organisation and human aspects of ITIL, such as team functions and departmental operations, and provides the opportunity to sit the ITIL Lifecycle examination in Service Operation. 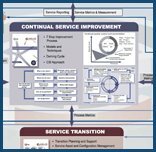 The ITIL Intermediate Qualification: Service Operation Certificate is a free-standing qualification, but is also part of the ITIL Intermediate Lifecycle stream, and one of the modules that leads to the ITIL Expert in IT Service Management Certificate.